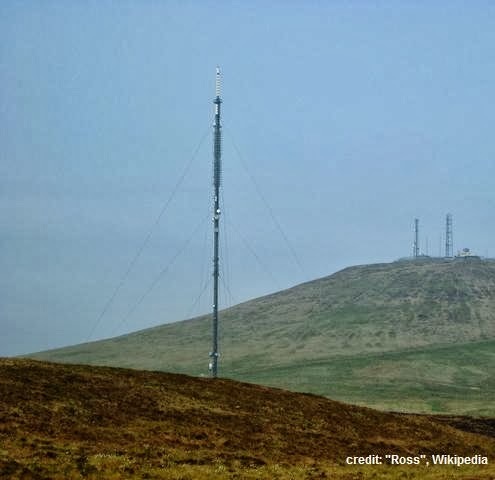 It's a whole year since the last analogue TV transmissions in the UK went off air, when the analogue signal in Northern Irland was last to be terminated. With digital switchover, HD TV reception via an aerial became possible and some viewers in Northern Ireland will soon receive extra HD channels via Freeview HD. The area around Belfast will soon have access to 10 UK Freeview multiplexes of channels, plus - in some locations- two Saorview multiplexes from the Irish Republic. The BBC ended its analogue service just after 11:30pm on the 23rd October 2012, closely followed by UTV. Around half an hour later, and into the first minutes of 24th October 2013, Channel 5 analogue from the Black Mountain transmitter above Belfast closed. The occasion was marked by a special simulcast on BBC One Northern Ireland and UTV: The Magic Box with Eamonn Holmes showcased some of the greatest pieces of Northern Irish TV history. At 10am on the 24/10/2012, attention switched to the Irish Republic when analogue TV was switched off south of the border. Also on that day: BBC One Northern Ireland HD launched and UTV HD joined Freeview HD after being cable only. A year on, UTV is finally catching up with the BBC by adding its HD channel on Sky and Freesat from 4th November 2013. On Sky HD, the channel will replace the standard definition version on channel 103. The future will bring even more digital choice, at least for some Freeview viewers across Northern Ireland. An extra multiplex from south of the border became available earlier this week for those able to receive the Saorview TV service from transmitters in the Irish Republic. Local community channel NvTV, which had a low-key analogue switch off in Belfast on the 23rd October 2012, will return next year on Freeview channel 8 in and around Belfast as part of the roll-out of local TV in the UK. Further local TV licences are to be awarded for other parts of Northern Ireland in the coming months: Limavady and Derry/Londonderry are both earmarked for a possible new local TV service. Viewers in Greater Belfast will gain access to news channel Al Jazeera HD before Christmas, when a new HD multiplex operated by Arqiva goes live at Belfast's Divis transmitter. The extra HD multiplex, which will be joined by another extra multiplex in the new year is being rolled out to 70% of UK households by next June. The two extra multiplexes will only be available in Northern Ireland from Divis transmitter. The multiplex launching before Christmas will also carry BBC Four, CBeebies and BBC News in HD, although the BBC is yet to confirm when these channels will launch in HD. In contrast, BBC Three HD and CBBC HD will be available everywhere on Freeview HD via the BBC's own HD multiplex, which has 98.5% coverage. Up to ten multiplexes are to broadcast from local transmitters. * Requires Freeview HD receiver, although not in HD. ^ Black Mountain, Carnmoney Hill and Brougher Mountain.